Ten on Tuesday, the bacon edition. Versatility. What else goes with carbs (pancakes, waffles, bread, beer), protein (eggs, peanut butter), and vegetables (lettuce and tomatoes) so well? Survival. We are in danger of being overrun with pigs. Eating them is vital to our survival as a species. Health. Remember "Pork: the other white meat"? Oh, and did I mention taste and aroma? This entry was posted in Food and Drink, Silliness, Ten on Tuesday. Bookmark the permalink. 0 Responses to Ten on Tuesday, the bacon edition. How about all the weird bacon themed/flavored things you can now buy? OMG I have never tried bacon with peanut butter! I must go fry some now! Seriously, I can go most of the year without eating meat, but somewhere during yuletide we have Bacon Fest, whereupon I bake a pound of bacon and we subsist on it for a day. Actually, I subsist on it. Daughter has more sense. I’ve got a reason, or two. That flavorful grease that makes your fingers oh so lickable. Anything that makes a dog a friend is inherently good. Love all your bacon photos! What is it with bacon? It seems to be popping up all over. 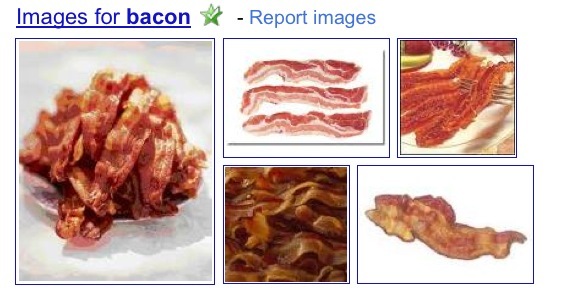 I have gone years without thinking about bacon, and now I seem to see it all over the net. I don’t think you mentioned taste or aroma. They seem sort of important. They should be on the list at least somewhere. Bacon is one of the Three Reasons for Living! Free bacon wednesdays at http://www.triplerocksocialclub.com Gretchen, the owner, is also a knitter and knitting teacher extraordinaire. They even have popcorn cooked in bacon fat. Also on spinach salad and German Potato Salad. Mmmmmmm, bacon. I really don’t want stirfry for dinner now. Favorite sandwich from childhood: whole wheat bread (toasted), tomato and peanut butter. I don’t care who knows it. Sooooo yummy!!! Yum, bacon. It’s the reason I’d never be a full vegetarian.